Destroys bacteria and algae in swimming pool waters. Most concentrated chlorine on the market. The powerful Dredger Jr. Cover Pump removes unwanted water from your winter pool cover fast! It is lightweight and submersible, and will pump up to 350 gallons of water per hour! Features a reusable foam inlet filter and stabilizing base platform, standard with the Dredger Jr. This powerful little pump will remove water to within 1/8 in. of the pool cover. Comes complete with garden hose adaptor and 25 feet of power cord. Dredger Jr. will also effectively remove standing water from your spa, basement, boat, and more. UL approved. 1-Year Warranty. Clean, Uncomplicated Design! The wide, textured risers of the Simple Step make it the smart choice for entry and exit from your above ground pool. This economical, yet rugged step provides dual handles and 27-in step width for confidence into and out of the water for young and old alike. The Simple Step is designed to meet or exceed all NSPI standards for safety and swimmer entrapment. Perforations throughout the unit allow water and chemical to circulate eliminating a dead water area where algae can grow. Top flanges anchor securely to any deck for a firm footing. This unit is easy to assemble snaps together in minutes with minimal tools and hardware. The Simple Step adjusts to accommodate 48-in to 54-in pool depths and swimmers up to 350-lbs. 3 year warranty. For use with any pool vacuum, this universal vacuum hose features flexible, yet durable non-corrosive material. A swivel cuff is built in for kink-free maneuverability during the cleaning process. The spiral-wound construction adds strength, aids in flexibility and provides maximum water flow. Superior tensile strength provides crush-resistant operation. 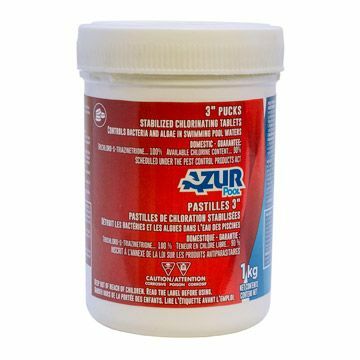 Hose measures 1-1/2 inch diameter x 35 ft.
1 kg 3-inch Chlorine Pucks Destroys bacteria and algae in swimming pool waters.